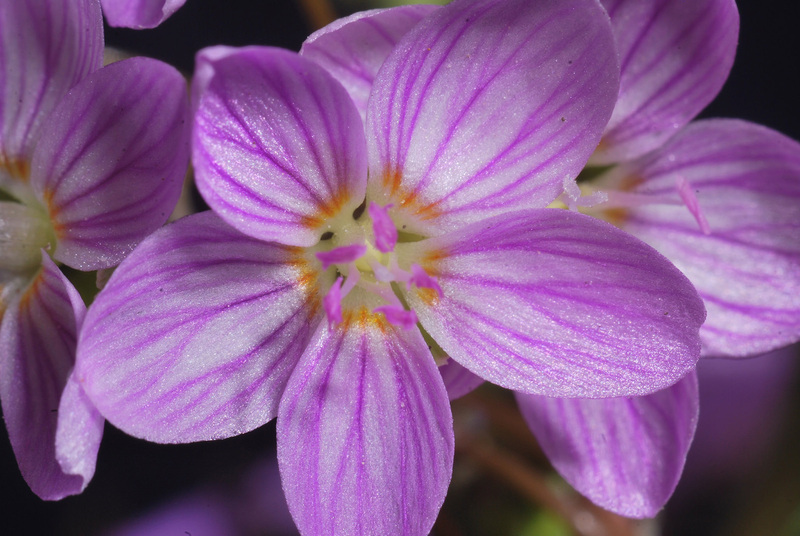 Scientific Name(s): Claytonia virginica L.
Photographer(s) Appreciation: This stunning photo of Claytonia virginica was taken by Bruce Brethauer (aka Glochidman@Flickr), a frequent contributor to Botany Photo of the Day. Claytonia virginica is an ephemeral herbaceous perennial found growing in dense clumps in moist meadows and woodlands. In the spring, eastern spring beauty corms send up multiple stalks–the greater the number of stalks, the larger the corm–each bearing several flower clusters. The pale pink flowers measure 8mm across and have 5 petals, 2 green sepals, 5 stamens with pink anthers, and a pistil with a tripartite style. Until recently, Claytonia virginica was most often placed in the purslane family, the Portulacaceae. DNA studies have recently confirmed that Claytonia is better separated with other close relatives into the Montiaceae. Eastern spring beauty is a myrmecochore: its seeds are dispersed by ants through a mutualistic relationship. Claytonia virginica seeds have a protein and lipid-rich structure attached to them, produced specifically for the ants that will collect the seeds and bring them to their nests. This nutritious structure, termed an elaiosome, is fed to the ant larvae. Once the larvae have finished their dinners, the seeds are placed into the ant’s refuse area, which provides a rich and protected growing environment for Claytonia virginica seedlings. Myrmecochory is increasingly regarded by ecologists as an important ecosystem driver, but this has not always been the case. As late as 1975, an overview of ant-plant mutualism posited that ants played little role in seed distribution, but by 1981 a study examining myrmecochory in West Virginian forests (part of Claytonia virginica‘s range) found that about 30% of herbaceous flora had seeds distributed by ants (see Beattie and Culver in Ecology). It’s worth pointing out that while eastern spring beauty’s seeds are distributed by ants, its flowers are pollinated by other insects. Andrena erigeniae, a small bee native to eastern North America, pollinates only Claytonia virginica and the closely-related Claytonia caroliniana. Another common name for Claytonia virginica is the ‘fairy spud’, owing to the corm that tastes like a small potato when cooked. Early settlers frequently ate this small ‘spud’, and also ate the young leaves as a salad green. The spring beauties — including Claytonia virginica, Claytonia caroliniana, and Claytonia lanceolata — were important foods for the indigenous peoples of North America, and the western Claytonia lanceolata has been particularly well–studied. In the book, Biodiversity and Native America, a quote by the late Lil’wat elder Baptiste Ritchie describes Claytonia lanceolata corms that were as large as a fist in areas that were being intentionally burned by the residents of Mount Currie, near Whistler, BC. These corms were harvested in large quantities and stored for winter use. It’s not clear whether traditional management techniques were also used to tend Claytonia virginica patches. See also a previous Botany Photo of the Day entry about a related species, Claytonia perfoliata. Thank you Tamara for yet another beautiful photograph and very descriptive commentary of a plant I was not familiar with. Wonderful, informative write-up today. I appreciate you touching on the morphology, taxonomy, ecology and ethnobotany of Eastern spring beauties. Keep up the good work. Lovely, evocative photo and an interesting writeup…spring beauties are blooming on the rocky, east-facing slope in the woods behind my house (in NW Connecticut) right now…but not enough to eat! It’s nice to have some of our eastern wildflowers appear here. This is neat stuff! I loved seeing these flowers bloom in the spring in my parents back yard when I was a little girl. I never knew that the seeds were dispersed by ants. Just goes to show how interdependent species are and that each species is immeasurably important to the diversity of our planet! I also had spring beauties (Claytonia lanceolata) blooming in my back yard as a child. I used to try to press them, but they are so delicate that the dried blossoms would always crack when I tried to pull them off the page. Parts that are tasty to ants, seeds that get carted off to ant middens, edible corms, a bee that just pollinates spring beauty: This is such great stuff. Whatever your next career step is, Tamara, it should involve writing about the natural world.